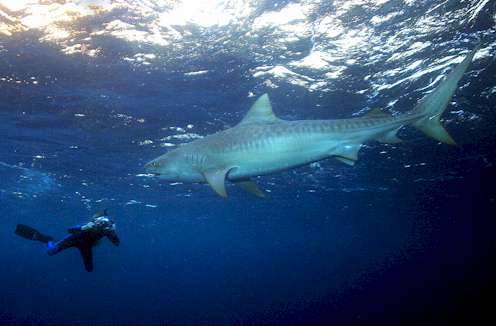 takes a photo of an approaching Tiger Shark. Image courtesy of Aaron Whittemore. Hammerschlag, Neil. 2004. Factors affecting predatory success of White Sharks (Carcharodon carcharias) at Seal Island in False Bay, South Africa. Nova Southeastern University, Masters Thesis, Nova Southeastern University Publication. Hammerschlag, N. 2004. A review of osmoregulation in freshwater and marine elasmobranchs. pp. 35-41. In: R.A. Martin and D. MacKinlay (ed.) Proceedings of the American Fisheries Society, fourth International Congress on the Biology of Fish, Manaus, Brazil. Hammerschlag, Neil. 2004. Sharing space with an Oceanic Whitetip. Shark Diver Magazine. Issue 7: 22 - 24. Hammerschlag, Neil. 2005. Making Faces at a Tiger. Shark Diver Magazine. Issue 9: 42 - 43. Hammerschlag, Neil. In Review. Osmoregulation in Elasmobranchs: A review for fish biologists, behaviourists and ecologists. Submitted: Marine and Freshwater Behaviour and Physiology. Hammerschlag, N. and Fallows, C. 2005. Galapagos sharks (Carcharhinus galapagensis) at the Bassas da India atoll: first record from the Mozambique Channel and possible significance as a nursery area. South African Journal of Science 101: 375-377. Hammerschlag, Neil, R. Aidan Martin and Chris Fallows. In Review. Effects of environmental conditions on predator-prey interactions between white sharks (Carcharodon carcharias) and Cape fur seals (Arctocephalus pusillus pusillus) at Seal Island, South Africa. Submitted: Environmental Biology of Fishes. Martin, R.A., Neil Hammerschlag, Ralph Collier and Chris Fallows. In Review. Investigatory behaviour and non-consumptive strikes on seabirds by white sharks (Carcharodon carcharias) at Seal Island, South Africa, with comments on possible motivations of attacks on humans by this species. Submitted: Marine and Freshwater Research. Martin, R.A., Neil Hammerschlag, Ralph Collier and Chris Fallows. 2005. Predatory Behaviour of White Sharks (Carcharodon carcharias) at Seal Island, South Africa. Journal of the Marine Biological Association of the UK, 85: 1121-1135. Have published photos in various books, websites, magazines, newspapers and Museums including Shark Diver Magazine (2004, 2005); The Miami Herald (2004); the National Geographic Website (2004); State of The Wild (Wildlife Conservation Society, 2005); Diving with Giants (New Holland Publishers, 2006); Defying Ocean's End (Island Press, 2005); Shark World Exhibit at the South African Natural History Museum (2004) and the Shark and Ray Exhibit at the Adrian Tolliday Exploris Northern Ireland Aquarium (2005). August 2004, American Fisheries Society, Physiology Section, IV International Congress on the Biology of Fish - Manaus, Brazil; presented paper, "A Review of Osmoregulation in Freshwater and Marine Elasmobranchs." October 2004, Oceans in Trouble: Public Forum at University of Miami - Miami, Florida. Forum staff and co-organizer. May 2005, University of Miami Research Creativity Forum, Miami, Florida; presented paper, "The influence of white sharks (Carcharodon carcharias) on a temperate marine ecosystem: a comparative study on direct and indirect effects." July 2005, American Elasmobranch Society, International Conference - Tampa, Florida; presented paper, "White Shark (Carcharodon carcharias) Predation on Cape Fur Seals (Arctocephalus pusillus pusillus) at Seal Island, South Africa: Present Knowledge and Future Directions." Have given talks on various aspects of shark biology at conferences, museums, government agencies, high schools and universities, including the Institute of Maritime Technology in Simons Town, South Africa (2003); Nova Southeastern University in Ft. Lauderdale, Florida (2003, 2004); University of Miami Rosenstiel School in Florida (2004); American Institute of Marine Studies (2003) and Miami Museum of Science (2005).